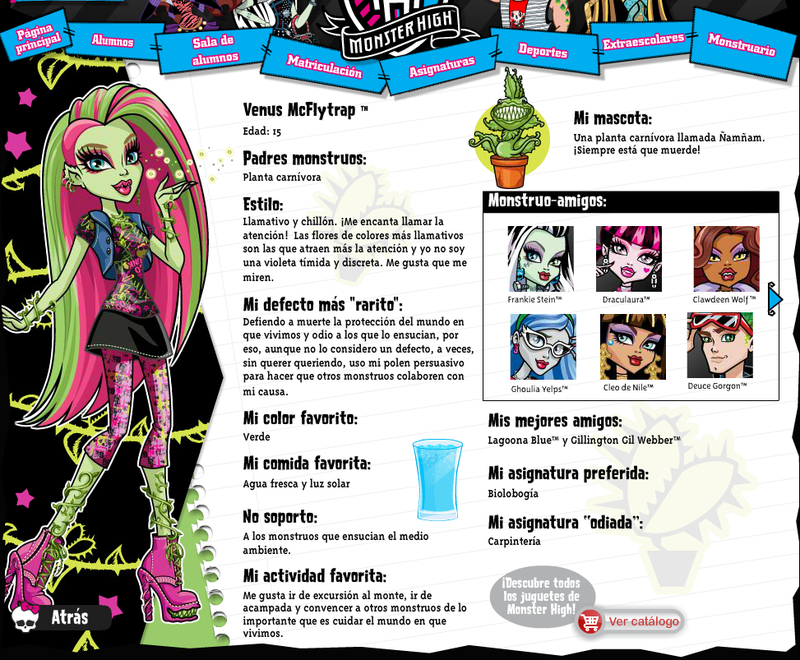 Otra de las monadas de Monster High. En este caso es uno de los últimos modelos que han aparecido en España, al igual que Robecca Steam. Vamos a ver que nos depara Venus Mc Flytrap. Venus McFlytrap es la hija de la Planta Monstruo. Por su pelo verde y fucsia, por su peculiar piel y por su ropa única, Venus McFlytrap es un poco rarita. Le encanta estar con sus amigas, beber agua y la luz solar y no soporta a los que ensucian el medio-ambiente. Viene con su mascota, una planta carnívora llamada Ñam Ñam y accesorios. A partir de 6 años. Monster High Venus McFlytrap Doll: The Monster High student body continues to grrr-ow with four new ghouls enrolling this year. 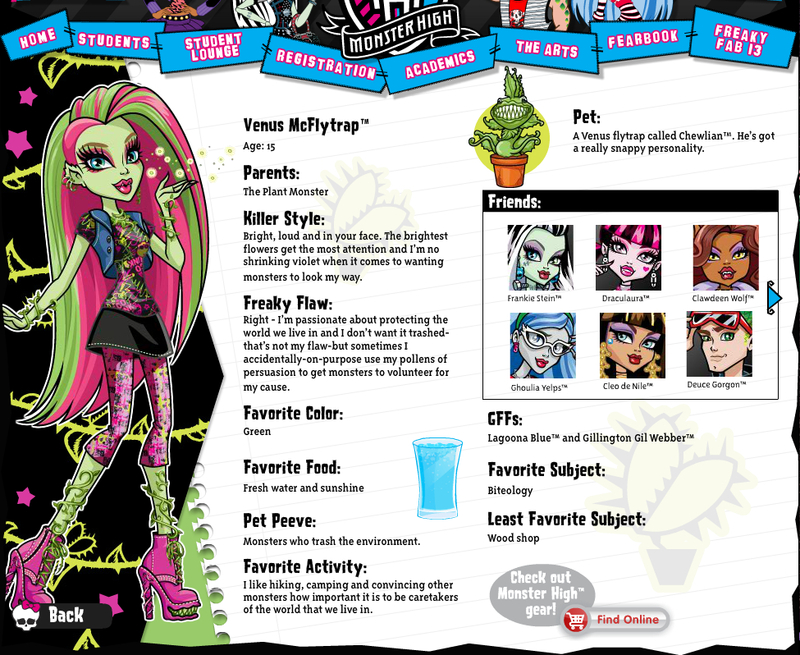 Like her fellow classmates, Venus McFlytrap doll has a signature style with lots of scary cool details and an ancient monster heritage. 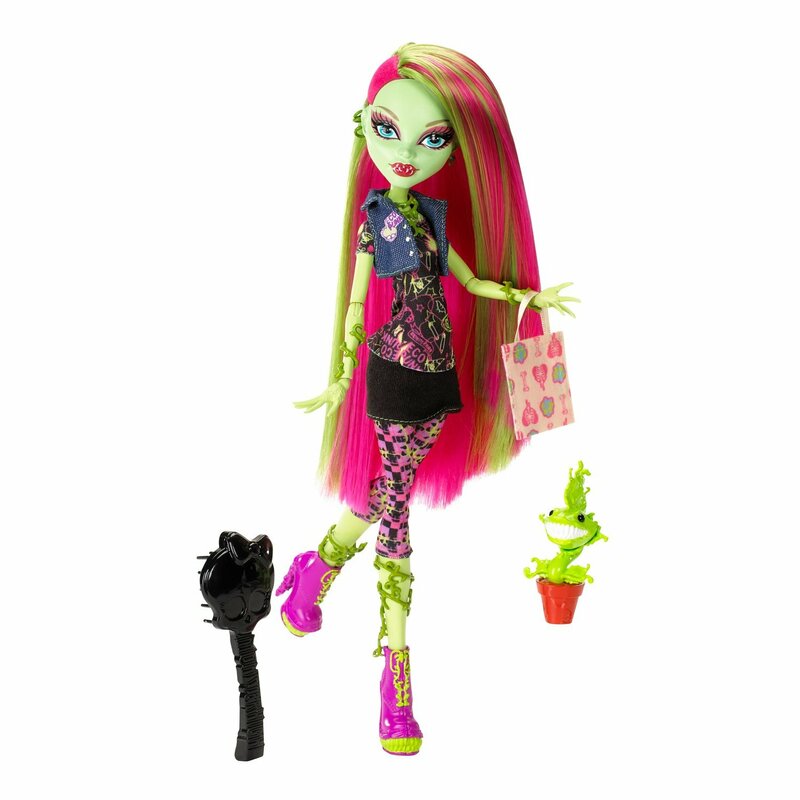 Venus McFlytrap grows for a London punk style made more unique with her perennial green hue and vine details. She has been known to use her pollen powers of persuasion to get the other monsters to volunteer for ecological causes. She comes with her pet, a Venus Flytrap (of course. ), and diary. The teenage children of the legendary monster menaces have gathered together under one roof to attend high school at Monster High. These ghouls are wild, they're fierce and they're totally trendy. They've left their parents' outdated haunting habits behind to form a killer style all their own. Collect all your favorite Monster High Dolls. Each doll sold separately. The ghouls from Monster High are freakishly fabulous Venus McFlytrap is the daughter of the Plant Monster Doll is fully articulated so she can be posed in many different ways Includes doll, pet Venus flytrap named Chewlian, diary, doll stand, brush, and accessory Collect all your favorite Monster High dolls.